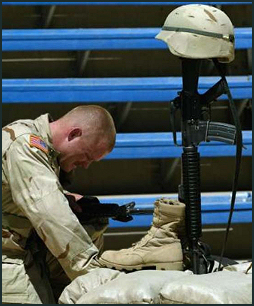 Regrettably, the war on terrorism has been a costly war for our men and women in the armed forces. 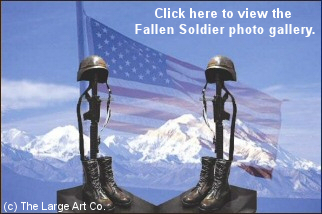 Between Iraq and Afghanistan we have lost over 2,000 Americans and many more wounded. While that number may seem small in the context of past wars, their loss and the loss to their family and community is important. 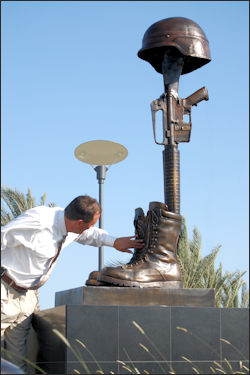 When a serviceman or woman is lost in the battlefield, it has become customary to arrange their Boots, Rifle and Helmet and the surviving members of their squad will gather around and memorialize their fallen comrades. Some of the troops will pray, others might recall funny stories, but make no mistake, this is a ceremony that is taken very seriously. Every soldier knows the next ceremony might be for them. This arrangement is also known as a Battlefield Cross or a Battle Cross. 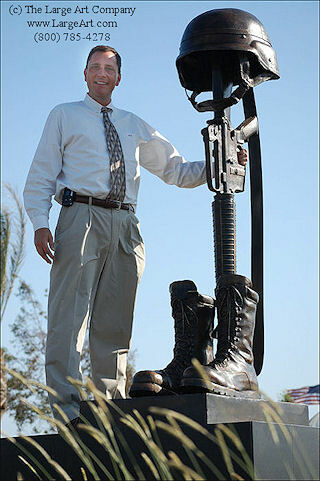 To cast this sculpture we used actual military items as models. 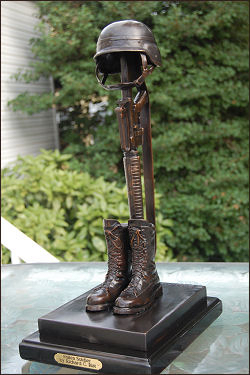 Then using 3d scanning and printing we created our original Fallen Soldier sculpture at two times the original size. It is so life-like you feel like you could pick it up. 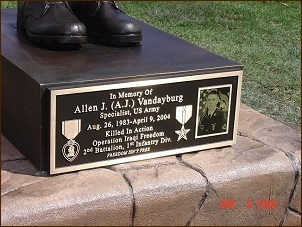 It is cast in high-quality American bronze using the ancient "lost-wax" method of bronze casting. The patina (coloration) is a traditional chocolate brown. This is a classic quality statue and built to last for hundreds of years. I have seen cheap knock-offs from Thailand that are paper thin and made from very low-grade bronze, so beware. We are currently pursuing copyright infringement. The sculpture measures almost 7 feet tall and the base is 24" wide and 36" from front to back and 4" high. However, we can mount this on a larger or smaller base as necessary. With the standard base the weight is approximately 300 pounds. Please call us toll free at (800) 785-4278 to reserve one of these for you. These are made one at a time. A new piece will take about 4-6 weeks although we generally keep at least one available. We can ship to most areas of the country within a week. There are many options to display this sculpture. This sculpture is cast from high quality bronze and with minimal care it is built to last for hundreds of years outdoors. click here for installation instructions.